I have two amazing children who are looking to me and my husband for guidance and direction. That is why I was so excited last year when I discovered that Minoa Elementary decided to partner with The Positivity Project (the P2). I knew that it was going to be something special for our kids, our family and our school. The more I learned about the P2 and its mission and vision, the more strongly I felt that parents needed to know about this! I reached out to our school’s point of contact, Kim Lake, and asked how I could help spread the word. Below are the six ideas, which Kim and I developed to better connect the P2 to students’ homes. But first, I’d like to share with you how the P2 has inspired my family — and sparked some remarkable conversations. My family loves football. Sundays at our house are full of zest and enthusiasm and the love of learning about football. Sometimes it requires a lot of hope and optimism, along with open-mindedness, perseverance — and usually a dose of self-control! Watching the games and learning about the players has afforded us opportunities to discuss leadership, bravery, humility, integrity, teamwork, fairness, and so much more. Football has been a platform for our kids to see character strengths used in real world situations, share their insights, and ask some pretty profound questions. Our youngest son, Cameron is a Carolina Panthers fan. It’s a Cam thing! 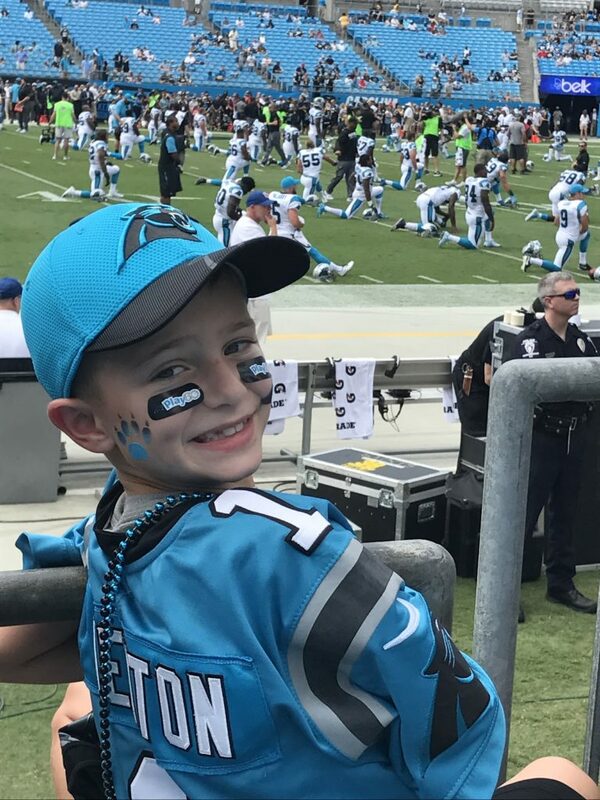 He was recently explaining to me that he read about the Panthers team mantra: “Keep Pounding.” The Mantra honors late Carolina Panthers player and coach Sam Mills. Cameron told me that Sam asked his team to “Keep Pounding” when encouraging the players prior to an important playoff game. The speech inspired the Panthers to win that game. At the end of our conversation, Cameron said to me “Mom, he was talking about perseverance.” I agreed with Cam that it was definitely about perseverance — and was in awe that an 8-year-old was truly able to understand what that means. A few days later, Cam came home from school and shared he started getting tired while running in PE and wanted to stop. But, just when he was about to stop running he told himself, “You can do this! Just Keep Pounding! You have to persevere!” Listening to him recall the story, it was obvious that he was very proud of himself for not giving up. I’m grateful that I was able to experience that beautiful moment with my son. I’m also grateful that he had the self-awareness and vocabulary to recognize the strength of perseverance in himself. I don’t think that would have been possible without the P2. Based on the quality of conversations we have had with our kids over the last year, I know for sure that the P2 is making a difference in how my kids think and feel about themselves and other people. By providing us with a shared vocabulary and a better understanding of the character strengths, the P2 has helped our family to have more engaging conversations and a stronger connection with each other. I believe that sharing information about the P2 will encourage families to have character-based conversations at home, and reinforce the “Other People Matter” mindset. It will also provide kids with the opportunity to discuss and recognize the character strengths outside of school and feel proud of themselves when they can teach their parents what they have learned! Below is a blueprint outlining some of the ways we try to keep families connected to the P2 and what’s happening at Minoa Elementary. We strive to provide parents with simple tools they can use at home to continue the learning that is taking place in the classroom. 1. The Remind app – it’s FREE! Remind is a free service that lets us send quick messages via text, push notifications, or email. 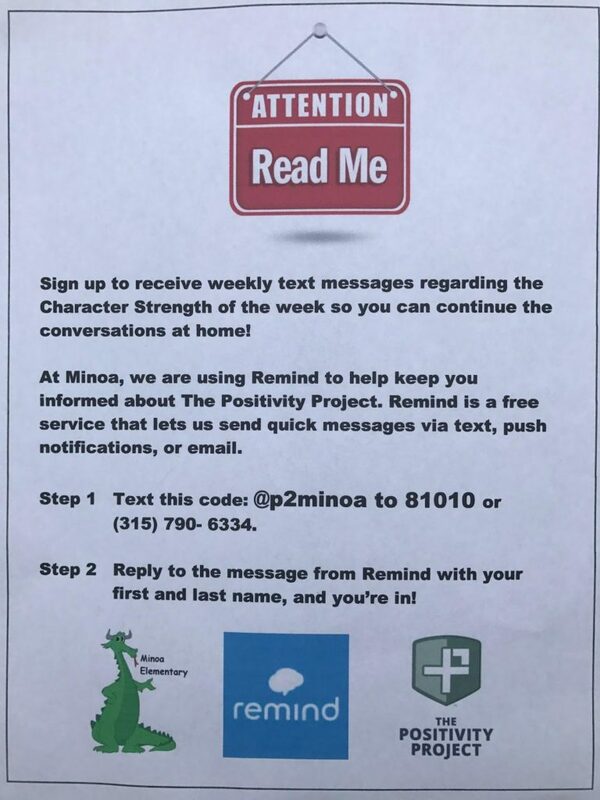 On Mondays, parents who have signed up receive a message highlighting the character strength of the week. 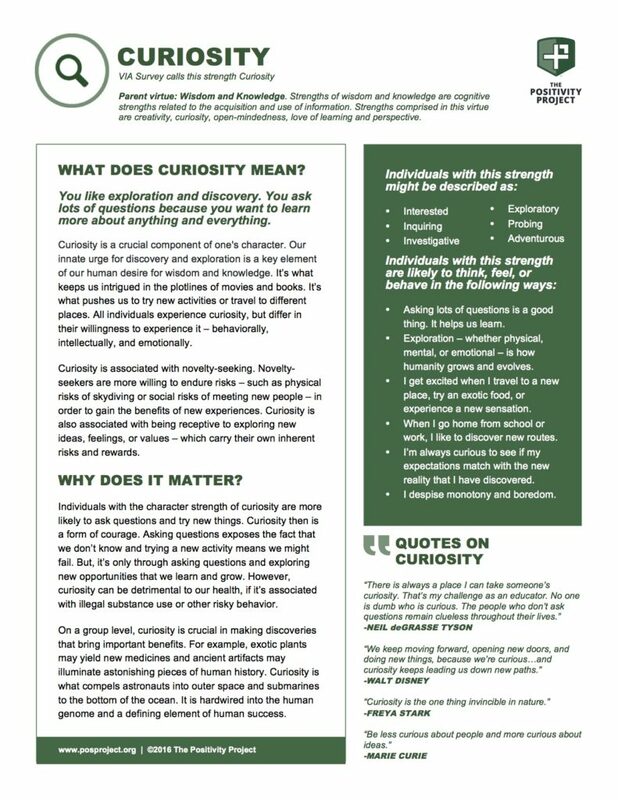 We often send a mid-week message with a character strengths related question to encourage conversations at home. Remind is easy to use — and messages can be created and scheduled for delivery days, weeks, or even months in advance. Teachers can also include the character strengths information or photos on apps like Seesaw, Classroom Dojo, or Class Messenger. At the beginning of each week, we send home the Character Card for that week’s strength. Families can use the information to gain a better understanding of each strength, along with the definitions and language being used at school to teach their child about the strength. The Character Cards can be found on the Resources section of the P2 website. We print them out and send a hardcopy home but an attachment to an email or in an app would work too! In our monthly newsletters, we discuss the mission of the P2 and the character strengths for that month. We also include information on ways that families can stay informed (Remind texts, PTO meetings, social media) and any other fun and exciting Positivity Project news or activities happening that month. Each week, we post information, quotes and pictures regarding the strength for that week on our school’s Facebook page. We also share posts from the P2’s Facebook page. 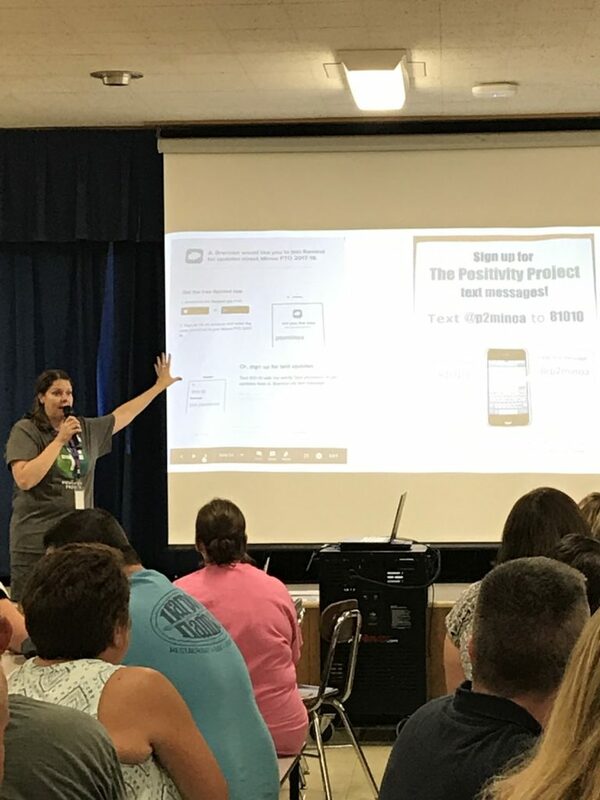 In addition, teachers will often share photos on Twitter of Positivity Project assemblies, activities, and projects happening throughout the school. Every month at our PTO meeting, students present what they have learned about the previous month’s character strengths. It’s very powerful to see the kids share what they have learned with the adults in the room. Parents always have great questions at the end of the presentation and the kids never fail to impress everyone with their understanding of the strengths. We use Remind texts, Facebook, and newsletters to invite families to join us at these meetings. 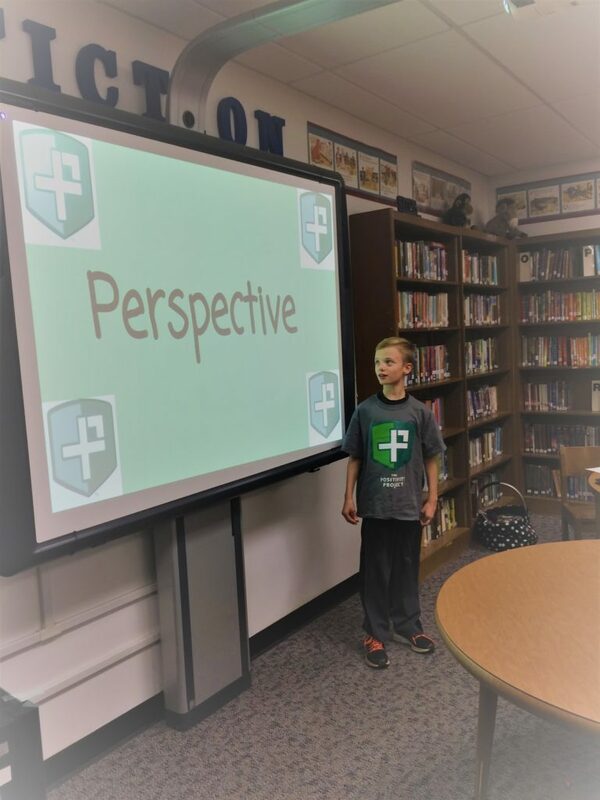 Nathan presenting at the PTO meeting. Our Parent Information Night includes a presentation on the P2. This has been a strong way to educate families about the P2’s mission and encourage them to sign up to receive the weekly Remind messages. Today’s families are busy. Feeling connected to the fast paced, ever changing world around them can be difficult. My hope is that by sharing information about the P2 with families, it will encourage them to have meaningful discussions, build better relationships, and embrace the “Other People Matter” Mindset. Proud mom of two amazing kids, married to her best friend, avid volunteer and passionate supporter of The Positivity Project.